GoXtra News: "Racially charged incidents between students and staff members are commonplace"
"Racially charged incidents between students and staff members are commonplace"
The 28th of August 2016 marked a turning point at Pretoria High School for Girls. In a school where stories of racism and injustice from black girls are usually met with silence from the staff, this time, our silence was met with police and dogs. Model C schools are meant to be a beacon of unity in the democratic South Africa where students of all backgrounds can achieve an enviable standard of education while having all their constitutional rights upheld. Most black girls who attend Model C schools will tell you that this is not the case. Our schools undervalue blackness and focus more on containing us than nourishing us. Racially charged incidents between students and staff members are commonplace, as are sweeping these issues under the rug and pretending that PHSG is a school that upholds the value of equal treatment. There are more incidents than pen can put to paper, but all of those experiences are valid. 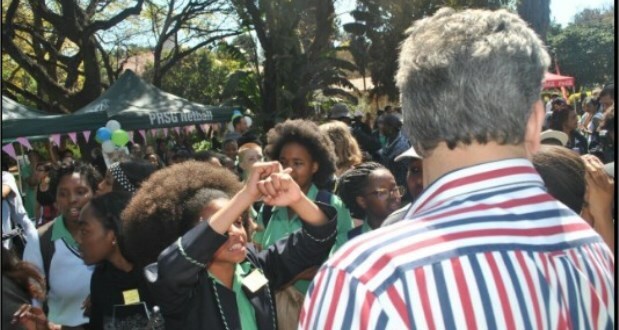 In 2015, a black student in grade 10 was told outside an exam venue that she had to “fix” her hair. With nothing to fix, she entered the exam. She was further told by a staff member that she would not be allowed to write her exam with her hair “like this”. This same student was, in a different incident involving a different staff member, told that her natural hair looked like a bird’s nest. Both members of staff involved have faced no visible repercussions and still stand to teach young black girls every day. Between 2015 and 2016, a now grade 11 student was hissed at by a member of staff outside her office and told to “comb your hair, it looks terrible”. When the student combed her hair, the teacher was further disappointed that only the length of the hair had changed and not the texture. 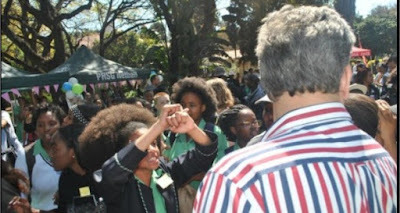 This same student has had her hair referred to as “kaffir hair” by two separate staff members. In the school hostel, a staff member reprimanded a girl for wearing a doek, calling it inappropriate for dinner and against school code. Stripping the doek of all its cultural meaning and significance with one remark. Hostel students have been told that spaces largely populated by black boarders resemble squatter camps, and told to comb through their hair with dirty combs pulled from old storage boxes before they could come downstairs for dinner. Incidents like these occur on a weekly basis at Pretoria High School for Girls. White students lovingly refer to Girls High as “the most fair and just” school that they know. They tell us racism doesn’t exist because they’ve never experienced it. Meanwhile, black girls live in fear and discomfort at existing in their skin in that same environment… the one that they trusted to keep them safe. Its clearer now more than ever that black and white girls may sit in class together, but we don’t experience the school in the same way. PHSG preaches that they want to create learners who are intelligent and capable of taking on the world. So during the week of the 28th of August: that is who we became. Black girls mobilised to stand as a unit and show Girls High that we see each other and they need to see us. Girls came to the school on civvies day with the intent to carry on as normal while wearing all black garments and doeks. Instead of attempting to start a meaningful dialogue, security guards loosely patrolled the outside assembly. Girls wearing doeks that sported the ANC logo were pulled from assembly and taken into the headmistress’s office. Teachers told learners in classrooms that they felt threatened and scared. Because black girls in colourful doeks are something to be feared. After school, groups of black girls were repeatedly told to disperse because they “appeared to be conspiring”. The general consensus of the demonstration on Friday was that we were seen, but not heard. And this was unacceptable. So, once again, black girls mobilised. We decided that during the school’s annual spring fair, we as black students would meet at the netball courts to hold hands and walk to the front of the school. No shouting, no dancing, no struggle songs. A silent walk of sisters, hand in hand. Before the group could get a head start, the security guards shut the gates, forcefully pushing girls backwards and reporting the procession as a “snaakse groep”. When the gates re-opened, attention was on us. Girls proceeded to walk to the front of the school and upon their arrival were met with a police car, extra security force and members of the governing body threatening to arrest girls as young as 14. All the while raffle tickets continued to be sold in the background. We came out of spring fair without the usual bags of candyfloss and fashion show tickets. We came out with knowledge and understanding. We know now more than ever that blackness is undervalued in our institution. We know that blackness is undesirable on black bodies but we need to feel complimented when Beckys plait cornrows or serve us in the tuck shop with box braids. As long as OUR hair fits the code, that’s all that’s important to them. We understand now that we are one another’s strength. When we stand together, our message is stronger. We understand that we cannot trust two old white men who work for other old white men to stand up and combat the injustice and incite the change we need. We understand that we have support. And we understand now, more than ever that the experiences written on our skin and twisted into our hair are valuable and unique and it doesn’t matter whether or others want to acknowledge them. We know we matter. Race matters. On the 29th of August, a presenter on Metro FM commented that the girls seen at the forefront of the protest weren’t matrics and looked about 14. This is correct. This movement isn’t about those of us on our way out. It’s about the girls who have years left at the school and deserve the chance to figure out who they are without harassment and fear. They don’t need to wait until they’re 18 to start seeing the value in themselves. The black students of Pretoria High School for Girls have lost faith in our school. But our motto “prosit spes labori” rings true. We are working in hope. Hope that because we are the seed, roots will rise from us and somewhere in the centre of all of this frustration a black student somewhere will feel comfortable in the skin under their school uniform. All of this is for that.